Millennials hate advertising and don’t respect brands – so what is a self-respecting 21st century marketer to do? Callum Negus-Fancey and his company StreetTeam would have you leverage the power of the upwardly mobile ambitious twenty-somethings themselves. StreetTeam helps brands build, deploy, and manage large decentralized ambassador programs to sell more goods. The English company just closed a $10 million round led by Kindred Capital, Frontline Ventures, and Backed and managed to bring on a number of strategic investors including Universal Music Group, Saatchi Invest, and Peter Davies. The $10 million round also includes the conversion of a convertible note. Negus-Fancey is looking to bolster sales in the live entertainment industry with nothing more than a platform and an understanding of social dynamics. You might not have heard of them, but StreetTeam is responsible for selling over 200,000 tickets to major festivals like Bonnaroo, Electric Zoo, and Spring Awakening. Of course, all of this was assembled carefully over time. The 25 year old founder has been utilizing the inherent power of friendship to sell products for over eight years. At 17, Negus-Fancey dropped out of college to found a company called Let’s Go Crazy with his brother Liam. His idea of organizing large dance events for teenagers wasn’t new, but his execution was innovative. Rather than sell tickets himself, he recruited friends to do it and rewarded them for doing so with free tickets and backstage passes rather than cold hard cash. The lesson he learned from his success was that for true fans, the value of one-of-a-kind rewards will always exceed the value of money. Over time, the idea became about more than just weekend parties. The company was facilitating the sale of £15 million worth of goods and it became time to rebrand as StreetTeam and dial in a formal growth strategy. This meant hustling to build an on-boarding platform for brands that could manage new ambassadors and provide promoters with engagement data from the decentralized workforce. The data isn’t about hiring and firing ambassadors, but about collecting data to better engage with diehard fans. One interesting way to think about the future of a company like StreetTeam is to think about open-source developer communities. Startups can stay hands off and let engineers tinker with projects that are self serving, all the while monitoring progress to recruit the best new developers. 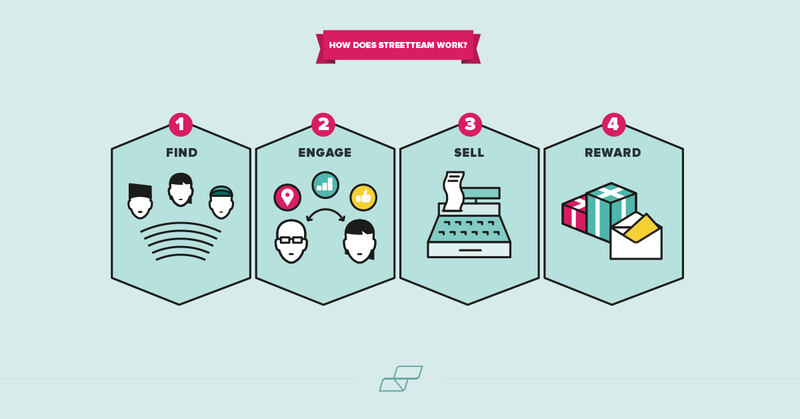 A product like StreetTeam’s could let young workers get their feet wet advocating for a brand and demonstrating their chops in a real world environment much in the same way. “There is a push towards freelance work in a more meritocratic world where I can say here is my personal brand,” said Leila Zegna, a partner at Kindred Capital. The idea of not paying ambassadors may seem like a cheat, but Negus-Fancey argues that throwing money into the equation just generates excess spam and creates a disingenuous atmosphere.